T2 was a progressive rock trio that attempted to take the Jimi Hendrix Experience/Cream sound a step further, which was quite possibly the intelligent thing to do back in 1970. Despite their relative youth, lead vocalist/drummer Peter Dunton, bassist Bernard Jinks and 17-year old guitar prodigy Keith Cross brought to T2 a fair bit of experience as former members of a variety of psychedelic rock bands such as Please, Gun and Bulldog Breed. Basing their sound on blues/jazz influenced hard rock with a loose almost improvised feel, and topping it off with the melancholic vocals of Dunton and brass-heavy orchestration, T2 crafted an album that is unique in the annals of progressive rock … and then disappeared! At the point at which they released “It’ll All Work Out In Boomland” (the album upon which the T2 legend largely rests) T2 was sitting pretty. They were signed to the influential Decca Records label and enjoyed a strong reputatation as a live band, playing at the Isle Of Wight festival alongside Hendrix. Unfortunately, after the release of the album, internal tensions led to the departure of Cross, leaving a second album unfinished in the vaults. 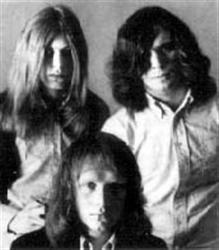 After initially attempting to continue with guitarist Mike Foster, the group called it quits in 1972. That same year Cross released Bored Civillians, an album he recorded with one Peter Ross as Cross and Ross, but little was heard of any of them for a couple of decades. In the early 90s, many forgotten progressive rock bands had their albums unearthed and exposed to a whole new generation of listeners and T2’s “It’ll All Work Out In Boomland” was no exception. Sadly each of the labels that handled the album (and it appears that there were three!) was not able to make it widely available for any length of time. Still, the re-issue of “It’ll All Work Out In Boomland” under German label SPM/WorldWide had the startling effect of prompting a T2 reunion. Dunton, Jinks and Moore (crucially Cross was not present) were the featured musicians on “Second Bite”, and T2 enjoyed a surprising second run, following it up with “Waiting For The Band” (1993) and “On The Frontline” (1994), although by the time of “Waiting For The Band”, Jinks had left and Moore had shifted to bass to accomodate new guitarist Ray Lee. The T2 revival didn’t last, but it helped make possible the release of the nearly completed tracks that had been intended for T2’s second album. Titled “Fantasy” (although it’s also known simply as “T2”), this album is a companion one to “It’ll All Work Out In Boomland”, boasting the same line-up and a similar sound, even if most of its tracks have a distinct unpolished feel. Most recently, Dunton was to be found playing in psychedelic revivalist band Sun Dial. He drummed on their 2002 release “Zen For Sale”, and Sun Dial frontman Gary Ramon has even released pre-T2 works by Bulldog Breed, Neon Pearl and Please on his Acme Deluxe label.